1- The 1st faculty on the Tree of Life represents Ausar, or the omnipresent faculty. This faculty represents the oneness of the universe. The basic particle from which everything is existence originates. It enables us not to separate anything from ourselves and to experience the true self. The one self. Ausar is the first tool that amen uses to govern existence. 2- The 2nd faculty on the Tree of life represents Tehuti, or the omniscient faculty. This faculty is the all-knowing faculty that has a series of 9 axioms. The Tehuti faculty enables us to manifest the indwelling divinity and to be able to resolve any problem. It is knowledge without thought tapping into the intuition or indwelling divinity. Unlike Sebek that is based on belief Tehuti is based on truth. It is the second tool that Amen uses to govern existence. 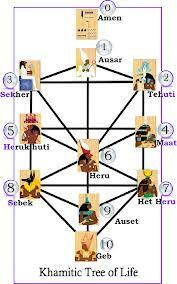 3- The 3rd faculty on the Tree of Life represents Seker, or the omnipotent faculty of the spirit. Seker is above Het-Heru because Seker enables one to be the divine by understanding that beauty lies within and being in synch with our destiny. This omnipotence is the 3rd tool that Amen uses to govern existence. 4- The 4th faculty on the Tree of Life represents Ma’at, or the divine law. This law is represented by 42 principles of Ma’at. Ma’at is a female faculty that represents the stage in which we no longer require guilt and conscience because we observe the law of heaven out of love and therefore the Ab (heart) is lighter than the feather and the Khu (spirit) is eternal. 5- The 5th Faculty on the Tree of Life represents HeruKhuti, or divine justice. This faculty establishes justice in the world, not by revenge or destruction, but instead by re-establishing the laws governing existence (MA’AT). Divine justice within our being consists of making peace, balance and harmony get achieved and restoring all to god’s order. 6- The 6th faculty on the Tree of Life represents Heru, or the will. This faculty is birthed by Auset and is beyond any animal desire. The will is successful only when the true self or indwelling divinity is victorious over anything – desires, emotions or lusts – which are contrary to the self. Heru is the Pa-heru (pharaoh) or in other words it means that your moral code is in concord with the divine essence and you are god on earth Pa-Heru. 7- The 7th faculty on the Tree of Life represents Het-Heru, or the imagination faculty. This faculty operates to create certain behavioral patterns. It must also be programmed because it is in this faculty that we could possibly perceive our happiness as contrary to the will of the indwelling divinity and therefore get stuck on a low level of the Tree. 8- The 8th faculty on the Tree of Life represents Sebek or the intellect faculty. Most people in Western society can only achieve Sebek. Intellect for the mere sake of intellect does not serve the purpose of the indwelling divinity but of Set. Sebek is an idea or belief based on programming. Sebek is only a correctly applied faculty in commune with Tehuti the omniscient faculty. Sebek is based on beliefs and can open or close the way to truth. 9- The 9th faculty on the Tree of Life represents Auset (Isis), The Goddess. This faculty is necessary to go into trance and reprogram your being. Auset is the vital part of reconstructing Ausar but first she must go through sorrows and give birth to Heru (the will) to overcome Set. Her determinants are devotion, receptivity and INTUITIVE. She is the source of trance and passion. 10- The 10th faculty on the Tree of Life is Geb. This faculty contains the electromagnetic body the khaibit and the molecular body the khab. The life force is governed by proper breath. It also includes the 5 organ systems notably the heart/small intestine, the lungs/large intestine, the liver/gall bladder, the spleen/stomach and the liver/bladder. These seven Divisions of the Spirit correspond to [an] ultimately a potential infinitude of the patterns of energy organization of Spirit. [There] is organizing utility as well as tutorial value in this particular breakdown of Spirit, and it is an organization that is now hallowed by tradition. the Heart Spirit: The Ab, corresponding to Spheres 6 (Heru), 5 (Herukhuti), and 4 (Ma’at), which mediates between the divine divisions of the spirit above, and the mundane divisions below. the Crown Spirit: The Ba, corresponding to Sphere 1 (Ausar), which is the faculty of omnipresence. It is through the crown chakra that we insperience the ultimate oneness of all of creation, and reconnect to the Source, the Itongo, or to the Atum, which unlike Democritus’ improper conception of the “atom,” is the final and ultimate irreducible reality.